This super easy to make breakfast will be come a morning staple! 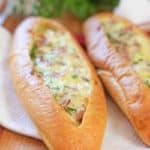 Simple beat your eggs and filling ingredients and pour into a hollowed out baguette! 1/2 cup grated cheese - I used a mixture of parmesan and mozzarella but anything will work! Cut a V shape into each baguette and hollow out - leaving about 1/2 inch border of bread (see above photo). In medium bowl, scramble eggs. Add cream, ham, cheese, salt and pepper. Spoon into boats - making sure each egg boat gets equal parts ham and cheese. Bake for about 25 minutes until egg mixture is puffy and bread is nicely browned. Cool for 5 minutes - slice and eat!